Bubbling Ponds Fish Hatchery resides on Commission-owned land approximately and is managed by the the Department’s Hatchery Program. 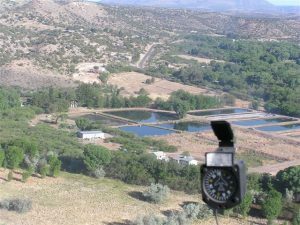 The hatchery is comprised of two separate properties, Page Springs Hatchery and Bubbling Ponds Hatchery totaling approximately 190 acres. This facility originally produced trout until 1980 when trout production was moved entirely to Page Springs Hatchery. Catfish production dominated for several years but was then phased into production of sunfish and bass. In addition several species of native fishes were cultivated. In the mid-1990’s, the hatchery began raising razorback suckers under contract for the Bureau of Reclamation. Since this time the primary production at Bubbling Ponds Hatchery has consisted of razorback suckers and a few other native species as well as a limited number of warm water sport fish. The property also provides habitat for rare or declining species such as northern Mexican garter snake, Page spring snail, and a rare species of caddis fly. 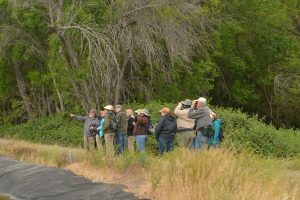 The Audubon Society identified the habitat at the hatcheries and the riparian area along lower Oak Creek as an Important Bird Area (IBA), which draws thousands of wildlife watching enthusiasts. 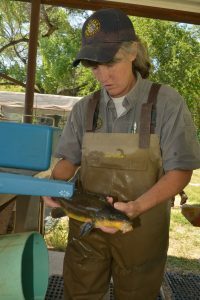 The department recently acquired the adjacent property to the west of Bubbling Ponds for native fish production which consists of 31.7 acres of land with water rights. This new native fish facility will support production ponds, a hatchery building and a visitor center. Bubbling Ponds Hatchery will be returned to warm water sport fish production focusing on rearing Florida strain largemouth bass. Bubbling Ponds Hatchery is located approximately 10 miles south of Sedona and 10 miles north of Cottonwood AZ.Springs road. The best access is from Interstate 17. Take the McGuirville exit (exit 293), turn west for approximately 10 miles to Cornville, AZ. ; turn north on Page Springs Road for 5.5 miles to hatchery entrance. Daily 7:30 a.m. to 3:30 p.m.